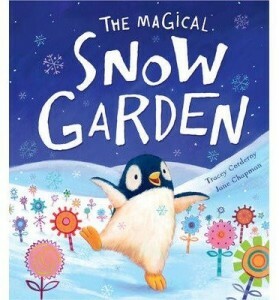 We’ve borrowed the German translation of The Magical Snow Garden (Gib night auf. Pelle Pinguin) from the library several times and are now enjoying reading the original English version with its glittery, silvery cover. The Story: Wellington the penguin lives in a snowy land. One day he sees a beautiful garden in a book and decides to create one too. He creates flowers using paper and other junk but one night a storm devastates the garden. Wellington’s friends comfort him before helping him to make a new one and animals come from far and wide to visit. 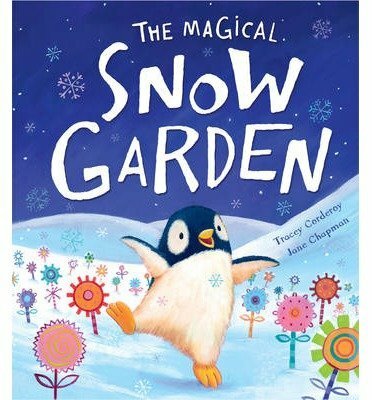 The Magical Snow Garden is a lovely story about friendship and making dreams come true. Wellington is a determined little penguin who isn’t going to let comments from his friends or the cold climate prevent him from creating his dream garden. He gets disheartened when his beautiful garden is blown away but his friends demonstrate their loyalty and friendship by helping him to rebuild it. Even Wellington’s friend Ivor, who has given up on his own dream at the beginning of the story, is inspired to make his own dream come true (we love the final illustration showing Ivor achieving his dream!). Jane Chapman’s illustrations are beautiful and are drawn on pale blue, pink and lilac backgrounds which contrast with the vibrant colours of the flowers. We love the expressions on the penguins’ faces and my daughter likes Rosemary the little bluebird who is Wellington’s special friend. The animals that come to visit are not all animals that you would associate with snow, we particularly like the koalas (especially the little one who falls asleep in an elephant’s trunk!). There is so much potential for using this book in the classroom. As well as stimulating discussions about friendship and following your dreams it can also be used to initiate discussions about what flowers need to grow – seeds, sunlight, water etc. Children could also make their own Magical Snow Garden using craft materials. I gave my daughter free range with our art supplies and the contents of my sewing box. 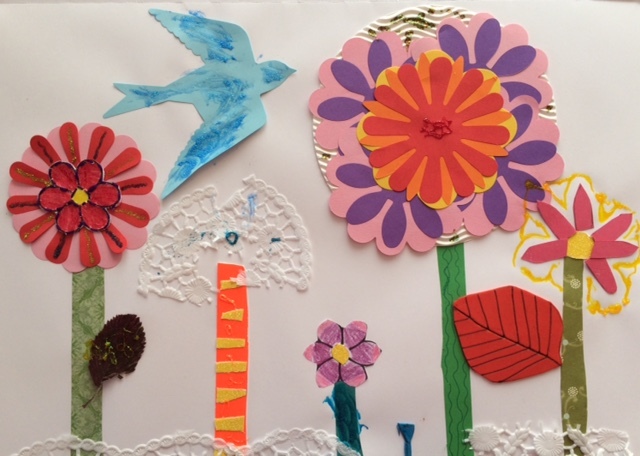 She had a wonderful time creating flowers for her own Magical Snow Garden (can you see the sewing she did on the flower on the left?). You could create a wonderful classroom display of Magical Snow Gardens either using individual pictures or asking the children to create individual flowers for one big picture. Wellington is a truly inspirational character and we love the way that the positive message about following your dreams is portrayed in The Magical Snow Garden. Thank you to Little Tiger Press for sending us a copy of The Magical Snow Garden. We’re so excited to have finally read this lovely story in English. That sounds like a lovely book and a great one for the build up to Christmas! I love her collage – it’s very good. It’s a lovely snowy book and the collage is a fun activity to accompany the story. This sounds like a wonderful book and I just love books that can be used in the classroom with the art connection. I have pinned this one!